In recent years, international exchange between Japan and the world occurring through sister city relationships is flourishing. Simple cultural exchange is developing into more substantial projects of mutual cooperation. Local governments' significant know-how and technology as the managing agency of the region are at the core of these efforts. This technology and know-how is developed largely through mutual human resources development including the receiving/dispatching of trainees and specialists between Japan and the rest of the world. 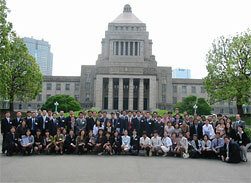 This programme assists prefectures, designated cities, and municipalities that wish to receive trainees from overseas. The training covered is extensive including general administration, the environment, education, and agriculture etc. and is highly regarded at home and abroad for its large contributions to regional development. In recent years you can also see trainees' contributions to local government problem solving efforts particularly in the fields of tourist attraction and multiculturalism. ・Fields : Every field (ex) tourism, industry, agriculture, medical care, etc. The hosting local government will bear the costs of the trainees' round trip plane ticket, accommodation, training costs, domestic travel etc. but this will be reimbursed to prefectural governments through the normal tax allocation and to designated cities/municipalities through the special tax allocation. MIC and CLAIR will process applications, carry out selection of trainees, and place them based on the wishes of the host local government. Local governments with sister city relationships, or other strong ties with a certain overseas local government can choose a trainee from there. The host local government, MIC, and CLAIR will cooperate to implement the following training. Trainees learn the Japanese necessary to make the most of their training and lives in Japan as well as the basics of local governance in Japan and Japanese culture. This is the main portion of the training. Trainees undergo specialized training in their field at their placement. Training content is decided by the host local government and will be from 5 - 11months.